How much does your life cost? Step one in working out how to price your art is working out what all you monthly and yearly expenses cost you. Find out all your monthly and annual expenses (distribute the annual ones evenly into your monthly expenses). Include everything you purchase regularly not just things related to creating your art. i.e. Mortagage Payments/Rent, Electricity bills, phone bills, groceries, Drinks at the end of the week... you name it, if it's an ongoing expense include it. Add up everything you spend over a year and divide by twelve to get the cost of you life per month. This is how much money you need to make to break even every month with no savings (unless you've factored in an amount for monthly savings into your expenses). How much do you want to earn a year? You know how much you need to earn from the previous section but how much do you want to earn every year? Before you start throwing out six zero figures, the higher the number you throw out there the harder you're going to have to work to achieve it. A good base income is the amount you need to earn per month multiplied by two. Essentially a 100% mark up on your life. Similar to how many retailers put a 100% mark up on every product they sell. Doing this means in one month you're effectively making enough money to cover all your expenses for two months. Once you've tried calculating your prices based on a 100% mark up you can calculate alternate price points by raising or reducing the mark up to see how it affects your pricing. How much of your Art do you need to sell? Specifically, how much of your art will you need to sell per month in order to make the amount of money you want to earn per month? Take the most common style of artwork you make, for example an average sized painting. How many of those can you paint in a month? To keep the math easy let's say ten. You can make ten of those a month. Now take how much you want to earn per month and divide it by ten to get the individual price of those artworks. You'll need to sell ten pieces of art at that price to make the amount you want to earn per month. The question then becomes, can you consistently make ten pieces of art in a month? If you can, great. If not you'll need to reduce that number to however many you think you can realistically make a month and do the division again. Once you have a price does that number seem realistic based on the kind of art you make? This is where a bit of research of your market helps. What prices are other people selling similar art for? Look around for other works of similar size, medium and style to yours. Try to get a broad cross section of prices. Probably best to exclude extemely well known artists from your research as their pricing will likely factor in 'investment' value, which will really distort their pricing in comparison to your calculations. Try to find an average price and compare that to what you've calculated so far. If it's about the same figure you're doing well. If it's higher than your calculation that's quite promising. You might even consider either raising your prices (for a higher montly income) and/or selling fewer per month at the higher price (for the same monthly income). If it's lower than your price that could be an issue. You'll need to consider whether dropping your prices and making more art per month is an option or not. You may even have to consider dropping how much you want to make per month (try to avoid going any less than a 100% mark up though). But I'm selling _______, how do I price that? It really doesn't matter what kind of artwork or art service you're selling, this pricing model applies across the board as a good starting point. 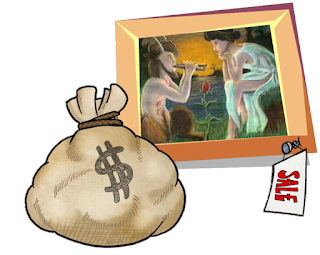 You need to know how much to sell of whatever kind of art your selling, whether it be original paintings, digital prints, greeting cards or an art service etc. in order to set a sales goal for each month. Making your sales goal per month will allow you to earn a decent living from your art. If you sell more, that's fantastic. If you sell consistenly less, you either need to work harder at selling or recalculate your numbers to keep your business running successfully. But I sell more than one type of art? This is where your pricing research will be really useful. You can still do the same math for each individual product or service. Find out how many of each product you'll need to sell in order to make your monthly sales target. Then factor in different quantities of each product you're going to sell each month in order to make up your total sales goal for the month. Since you have three very different items you can mix up how many you sell of each based on how many of each you think you can produce per month so long as the total amount matches your sales goal. Altogether totalling $100 per month. The actual amounts of each product you sell could also be tied to the popularity of a specific item, once you start getting an understanding of what is selling best. You may choose to make more of a popularly selling item because you know there is a better chance of making a sale. But my work takes longer than a month to make? No problem. To calculate pricing you'll need to add up the sales goals of however many months it takes you to make an artwork and this becomes the base price for that artwork. If it looks too high you're going to either need to work quicker or make and sell more than one at a time. When it comes to selling the artwork, you'll need to project the sale forward into your future sales goals. That way you're not behind whilst waiting to make a sale for a period, you're ahead on sales goals for future months. To explain, every time you sell an artwork that takes months to make, you spread that amount across the sales goals of future months until it no longer covers the sales goals of that month. The first month that it doesn't cover the sales goal, is the month that you know you'll need to sell another artwork in order to make your living for the next few months. Ideally, the time it takes to make your artwork is less than the time it takes before you'll need to make another sale, thus you'll earn a living and keep up with demand. 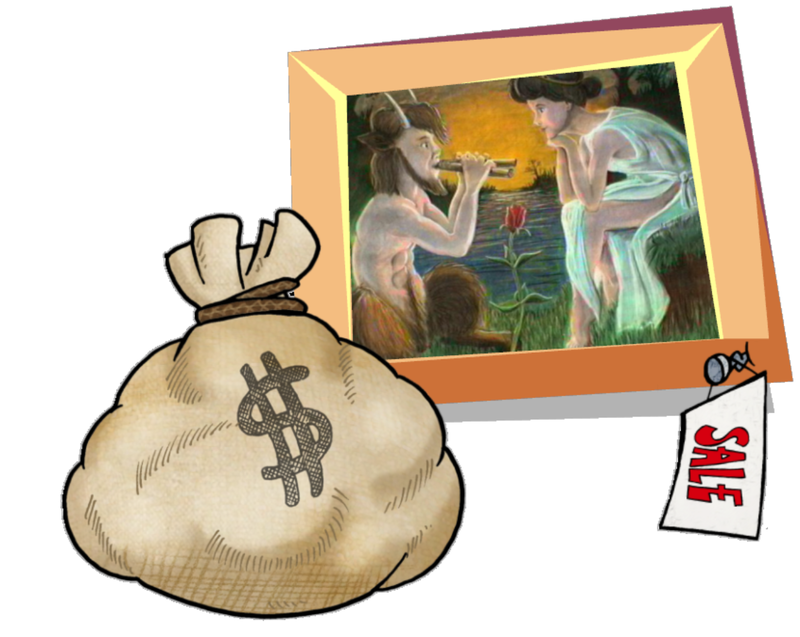 As I said at the beginning of this article there are many different methods to price your art. My method should really only be a starting point. The main advantage is that this method assesses your life and helps you to understand how much money you'll need to make in order to earn a full time and relatively comfortable living. Many other methods often focus on individual artworks and don't seem to have any connection to your business as a whole. The market you're selling to. The prices you command on eBay are going to be very different to those you can potentially earn from a real world gallery for the exact same piece of art. If your prices are too high for the market you're trying to sell to, you won't get any sales. Wholesale versus Retail pricing. The prices you calculate in my method are really wholesale prices. These are the prices you must sell your work at and still make a profit. To get your retail pricing you should, at minimum, double your wholesale price. This then gives you some leway for offering discounts whilst still always making a profit. This pricing model does not take into account the investment value of your work, if your art is seen as an investment by your collectors or you want it to be seen as an investment purchase. The emotional demand and/or subject of an artwork is also not considered. You may create art that really pulls at the heart strings for many viewers or is of subject matter that is in high demand. Artworks like this may command higher prices then similarly sized works that have less emotional impact or are of less popular subject matter. When it comes to art, pricing can be a very personal thing. If you just want to be practical or need somewhere to start then the above method works well. Once you start selling you'll get a feel for what sells and what doesn't and how much you can price things at. Remember that, in the art world, the cheapest pricing isn't always the best pricing to go with. Higher pricing is often associated with quality and/or prestige. Try to be consistent with your pricing and always remember to price with your overall sales goals in mind.